Discussion in 'Gear & Equipment Discussion' started by Cr3do, Jan 7, 2013. Guys, Im really confused now on which gloves to get! Since I have only got back into training after a couple of years off, and will be only using boxing gloves 2 x per week, as I train MMA, will Winnings be an overkill? I mean I could get 2 pairs of GOOD other gloves and still have change left over. I see a lot of use 16oz for sparring and 10-12oz for pads & bag work, and that it is good to use rotate gloves. I can not afford to get 2 pairs of Winnings, so would you guys do in my situation? And if you can recommend any gloves, that would be great. haha i know what you are going through mate. I think it depends on what you are going to use the gloves for. i recommend you buy lower weight of winning gloves as you will be using mma gloves for sparring. You are thinking too much bro. I search for a lot of glove options when i am off-training but once i go back in training i just use one pair of gloves and i don't care to buy new gloves unless they are worn out. Just my 2 cents. If you can afford them with no problem go for them. Are they overkill? Yes, but they are more of a status symbol based on their price. You sure jumped to getting Winnings pretty fast. If not there are other high quality gloves that do the job and have good protection, but they are the best and longest lasting. Most people I know who actually fight just get them for mitt/bagwork and use a different brand for sparring. Since you'll only be using them twice a week, I think you'll be able to get by with just one pair of gloves. Title and Ringside both sell good, comfortable, durable gloves at good prices -- there's no need to spend a fortune. Please don't be the guy who keeps using his sparring gloves for bag work, and then thinks it's okay to keep using them for sparring as well. You need to figure out what you'll be happy to spend. With less than $100 you can easily find a good quality pair of gloves that any professional would be fine with using in their day to day training and will last. 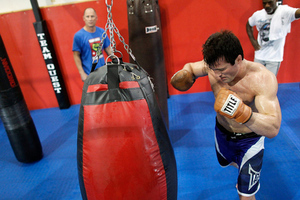 Most of the top MMA fighters make do with much cheaper Thai and MMA branded gloves. So that's $100 and you'd have gloves for sparring and bagwork at $100. Not saying you should get those specific gloves, just that you can get decent gloves and still have enough money to spend on other important things like a custom mouthguard, headgear etc. If you want the absolute best then you have to pay $$$ for it but you really don't need to have the absolute best here, and it'll be a luxury buy. if he uses 16oz Winnings on the bag only a couple times a week, how long do you think it'll be before they're unsuitable for sparring? 2-3 years? It's a non-issue. Alrite fellas, I've bit the bullet and gone with Ring To Cage Delux MiM Foam Sparring Gloves with Safety Strap, from mmawarehouse.com at a really good price, with fast delivery to the UK. Can anyone recommend a good glove with wrist protection for bag, pad technique work? Roughly 10-12oz? Also looking for a good headgear but not Winning prices. Thanks for the help and input guys! The Ring to Cage MiM gloves make good bag gloves also. I would buy another pair if the money is there. If you don't mind laces then this is a great option for a Protective 10 oz. bag glove. A great option for head gear would also be the Ringside Masters Competition Head gear. http://www.ringside.com/ringside/fight-gear-master-s-competition-headgear-8954.html It is very protective with large cheek protectors and a soft laytex padding. It has a popular Mexican style cut pattern. Forgot about this...It is indeed an excellent option!